Melvyn Dubofsky suggests many histories of the IWW are clouded by myth, including the figures most deserving of our respect and attention. Two aspects of the commemoration of the Industrial Workers of the World (IWW) tradition strike me as especially odd: first, that it occurs at a moment when the labor movement and trade unionism appear to be at a historical nadir and conservative antiworker forces ride tall in the saddle; second, and more notably, that it is so unlike the atmosphere that marked the IWW’s golden anniversary in 1955. Fifty years ago, few cared about the IWW or its history and traditions. AFL–CIO leaders and rank-and-file union members wasted little time or thought on an organization with few members and less influence. It merited no newsprint in daily papers, monthly magazines, or weekly journals of opinion. Scholars, whether historians, labor economists, or industrial relations mavens, evinced no interest in a dinosaur from labor’s ancient past. Even when I began the research for what became my history of the IWW, that subject was the farthest thing from my mind, a mind focused on the question of why hard-rock miners in the Rocky Mountain West built a radical union and practiced socialist politics at the turn of the twentieth century. No major scholarly work had been written about the IWW since the 1920s, and it was, moreover, a subject that trained historians had neglected. The IWW survived mostly in creative literature and the performances of folk singers who revived some of the tunes featured in the Wobblies’ “Little Red Song Book.” Wobblies endured in John Dos Passos’ grand trilogy USA, where a primary protagonist of the first volume in the trilogy, Mac, exemplified the Wobbly tradition and where the author painted word portraits of such IWW leaders as William D. “Big Bill” Haywood and Vincent St. John; Wallace Stegner’s fictional recreation of the IWW bard and martyr, Joe Hill, in The Preacher and the Slave; Dashiell Hammett’s opening pages of Red Harvest, where an exemplary Wob worker appears, and in James Jones’ tribute to “bindlestiffs” in From Here to Eternity. Two forces that came to a head in the 1960s brought IWW traditions, if not the organization, back into prominence. The civil rights movement and the rebellion of the young associated with SDS recalled the Wobblies’ most glorious moments. Like the Wobblies who fought in the streets of Spokane, Fresno, San Diego, and other American towns and cities to establish the rights of free speech and free assembly against repressive local and state authorities, African Americans and their allies turned to direct mass action in the streets to assert their rights as free and equal citizens against the practitioners of an American form of apartheid. Like the Wobblies who filled the jails of Spokane and other cities in defense of free speech, civil rights crusaders packed the jails of Birmingham, Alabama and Albany, Georgia to win the most basic rights of citizenship. Like the Wobblies when asked who their leaders were responded, “We are all leaders,” the members of SDS tried to practice “participatory democracy” in which no person’s voice or rank carried more weight than another’s. Like the IWW which insisted that the law as practiced in the U.S. served the interests of capital and not the working people, SDS exposed how the practice of democracy in the U.S. contradicted the promise of free and equal citizenship. Like the Wobblies of old, the activists for civil rights and the student rebels sang, danced, and satirized. And, perhaps most important, just as the Wobblies in the early years of the twentieth century saw themselves riding a powerful transnational wave of revolution, the generation of 1968 saw itself as part of a surging transnational movement to liberate humanity from exploitation, penury, and repression, whether in the streets of Chicago, Paris, Prague, or Pretoria. Certainly, I felt those powerful influences at work in the 1960s as I sat before the precursors of the PC tapping out my history of the IWW, a book that could have taken the form it did only in the 1960s. Today we look out on a world far different from that which gave birth to the IWW or that which shaped my history of the organization. Today only the most fatuous can see themselves surfing gloriously forward on a revolutionary wave about to inundate the globe. Here at home in the United States we see a union movement that can claim at best less than 8 percent of private sector workers and in which masses of low-paid, materially insecure workers prefer the cut-throat capitalism of Wal-Mart, the pieties of George W. Bush, and the certainties of that old-time religion to the appeal of labor united or the solidarity of an international brotherhood and sisterhood of labor. Before our eyes lie the shattered structures of “actually existing socialism” and the failed states of colonial liberation. In such a time and such a world what does the history of the IWW have to offer us? Should we approach the Wobblies’ one-hundredth anniversary as a time to celebrate or a time to mourn? Even some of the most famous events associated with the history of the IWW lead to contradictory interpretations. What should we make of its most famous and most often studied and narrated industrial conflict, the 1912 “bread and roses” strike in Lawrence, Massachusetts? In the short run, the strike proved that the less skilled new immigrant and women mill workers heretofore neglected by the AFL affiliate with jurisdiction in the textile industry could be organized and could maintain interethnic solidarity during a protracted conflict. The strikers even achieved their immediate demands. Yet, within a year, almost all traces of IWW membership and influence had been eliminated by the American Woolen Company and other textile mills in Lawrence. A comparable strike the following year by silk workers in Paterson, New Jersey, produced a more calamitous result. An equally diverse group ethnically, Paterson’s silk mill workers engaged in an even more protracted and bitter strike, one that gained greater public exposure than the previous year’s conflict in Lawrence because it occurred in the shadow of Manhattan, already the nation’s media capital. The Socialist party daily, the New York Call, filled its front page with stories from Paterson, as did most of the megalopolis’s other dailies; John Reed covered the battle for the readers of The Masses, and his fellow Greenwich Village socialists, radicals, and bohemians lionized the fighting silk workers from across the Hudson, a process that culminated in the dramatization of the strike at a pageant held in Madison Square Garden. In the end, however, the strikers suffered utter defeat, a calamity that Elizabeth Gurley Flynn sought to disguise by claiming that the struggle and defeat had taught workers a vivid lesson in class and class consciousness. And the “fragile bridge” that had been constructed during the strike between IWW leaders and workers in Paterson and their radical intellectual and cultural allies across the river collapsed in a flurry of mutual recriminations.6 What had gone up like a rocket, in the words of one Wobbly activist, had fallen with a thud. That was a pattern that seemed to repeat itself in Wheatland, California that same year, the forests and lumber mills of southwestern Louisiana, and in 1916 on the Iron Range of northeastern Minnesota. Yet, between 1916 and 1917, the IWW achieved successes previously unimaginable. For the first time, it built strength among the migratory wheat harvesters who moved annually from north Texas to the Canadian prairie provinces. In the Northwest, it won the loyalty of thousands of loggers toiling in the Douglas Fir and pine forests of the Inland Empire and the coastal rain forests. And in Montana and Arizona, it made substantial inroads among underground copper miners. All in all by mid-1917, the IWW could justly claim more than one-hundred-thousand dues-paying members (although membership turnover remained high). The IWW built its membership among such workers not by promising “pie in the sky” or revolution in the bye and bye, but by fighting for a minimum daily wage, the eight-hour day, safer and more sanitary working and living conditions, and a measure of justice on the job for itinerant crop harvesters, loggers at work in isolated lumber camps, and underground miners. Rather than denigrate bargaining with employers and written agreements (contracts), the Wobblies now fought hard for them. Rather than disparaging leadership and asserting that “we are all leaders,” the Wobblies welcomed the services of the cadres who organized the harvesters, loggers, and miners and who maintained membership records, collected dues, and coordinated work actions. They also adjusted to the more coordinated and centralized leadership that General Secretary Treasurer Bill Haywood implemented at Chicago national headquarters. Organizational growth and success came partly from a more disciplined leadership that better administered the quotidian activities of the rank and file and partly from a war-induced tight labor market and the essential role food, lumber, and copper played in the war effort. 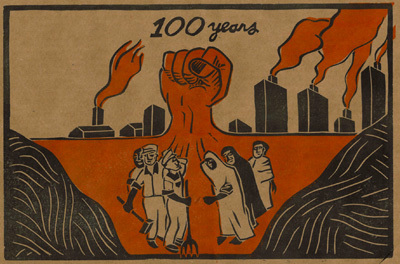 Both bases of IWW success in 1916–1917 proved the organization’s undoing. Because IWW membership and workplace actions were concentrated in economic sectors vital to the war effort, their business enemies portrayed Wobblies as agents of the Kaiser and beneficiaries of German gold. Because, with few exceptions, Wobblies considered the class war at home more vital than the world war abroad (although the IWW took no official position on the war after the U.S. entered it and most Wobblies enrolled for conscription), the organization became a target of federal repression. Employers and their agents may have used violence to combat the Wobbly threat to wartime production and profits, as happened in the lynching of Frank Little outside Butte, Montana or during the infamous Bisbee, Arizona, mass deportation of July 1917, but it was the federal government that acted to put the IWW out of business. It did so in September 1917 through a series of federal raids on IWW offices throughout the country and mass warrants for every known IWW official or prominent activist, including the former general secretary treasurer, Vincent St. John, who had departed the organization three years earlier to prospect for gold in the Southwest. One hundred and sixty-six IWW leaders were arrested and jailed in Chicago, charged with violating the wartime sedition and espionage statutes. Smaller but substantial numbers of IWW officials filled the jails and faced similar charges in Wichita, Kansas, Omaha, Nebraska, and Sacramento, California. The men and women (actually Elizabeth Gurley Flynn was the only woman so charged) who had built the IWW’s strength in the wheat fields, forests, and copper mines had become federal prisoners awaiting their day in court. The organization that they had led transformed itself from a militant labor organization into a legal defense organization; the Wobblies released from jail on bond devoted their time and energy to raising legal defense funds, not organizing workers or coordinating job actions. Equally important, the federal campaign of legal repression, a campaign that largely succeeded in convicting all the Wobblies charged with violating the wartime statutes, exposed significant rifts among the organization’s most prominent figures and the lesser-known individuals who did the dirty work in the fields, forests, and mining towns. The diametrically opposed reactions of Vincent St. John, “the Saint,” and Elizabeth Gurley Flynn, “the rebel girl,” to federal legal action highlighted one such split. St. John, who had left the IWW before the U.S. entered the war and hence could scarcely be charged with engaging in sedition or espionage, voluntarily surrendered himself to federal authorities and stood trial together with his former brothers in Chicago in April 1918. Gurley Flynn, who remained active in the IWW well after war erupted and did not sever her affiliation after the U.S. entered the conflict, wrote a lengthy letter to President Woodrow Wilson in which she portrayed herself as a naive young woman, a true American patriot, who sought only to better the lives of the less fortunate among her fellow citizens, and a person who would do nothing to threaten the well-being of her nation. She importuned the president to dissociate her case and that of her then lover, Carlo Tresca, (as well as Tresca’s fellow Italian immigrant syndicalists, Arturo Giovanniti and Joe Ettor) from the remaining Chicago indictees.7 In the event, Gurley Flynn did not stand trial in Chicago or anywhere else as a consequence of her activities for the IWW. The post-trial and post-conviction stage disclosed yet another series of internal splits. Freed on bond while attorneys appealed their conviction in Chicago, Haywood, most prominently, and several other convicted Wobblies jumped bail and fled to the Soviet Union. Their legal appeal having failed, the remaining convicted Wobblies, secure in their innocence, surrendered to authorities and began their sentences at the federal penitentiary in Leavenworth, Kansas. For most of those who chose imprisonment to flight, Haywood and his fellow exiles had become traitors to the IWW and the working class. These are the Wobblies who we should remember for they were precisely the sort of people who engaged most strenuously in the struggle to liberate workers from servility and dependency on the job. Those who, like Embree, found their greatest joy as fighters maintained the spirit and commitment to organize workers and to build labor’s strength even in the worst of times. It was such people, like the Detroit automobile worker, Nick DiGaetano, a former Wobbly, who built unions in the depths of the Great Depression. For DiGaetano and Doree, Embree, and Fletcher, labor organization was not simply about raising wages, reducing hours, insuring job security, and transforming producers into consumers; nor was it about ignoring immediate needs in order to further revolutionary goals. No, in the words of DiGaetano that would have been shared by Doree, the larger purpose of the union was “. . . to change a plain, humble, submissive creature into a man [or in today’s nongendered syntax a person or mensch]. . . . I am talking about the working conditions,” DiGaetano went on, “and how they affected the men in the plant . . . Before they were submissive. Today they are men.”12 That is the essential lesson that the IWW’s “sparkplug unionists” taught when they hammered the theme of class struggle at the point of production as the essential element that liberated working people from thralldom. Only when workers free themselves through direct action on the job from the chains of submissiveness and dependency do they become equally free and independent in the larger civil society and its political arena. Only through struggle, organization, and solidarity can workers act as free and equal citizens in a true people’s republic. Melvyn Dubofsky is Distinguished Professor of History and Sociology at Binghampton University, SUNY, and author of numerous books and essays in labor history, including biographies of John L. Lewis and Big Bill Haywood, The States and Labor in Modern America, and Hard Work: The Making of Labor History. (New York: Oxford University Press, 2005). Buhle has also recently written a highly romanticized tribute to the IWW in Monthly Review, ( June 2005): 13–27. University of Illinois Press, 1969) and my biography of William D. Haywood, “Big Bill” Haywood, (Manchester, UK: St. Martin’s Press, 1987). 3. It is also the myth at the heart of Buhle’s Monthly Review essay. 4. Insofar as we can determine from the remaining evidence, nearly all the references to human brotherhood and sisterhood across the lines of race, gender, and ethnicity came from IWW leaders or spokespeople. We know far less about the sentiments of rank-and-filers who moved in and out of the organization, and we have little reason to believe that their feelings differed from those of rank-and-file members of the mine workers’, garment workers’, and even craft workers’ unions inside and outside the AFL. A careful reading of most IWW newspapers and publications would also show that the IWW typically perceived women as primarily wives and mothers-to-be, society’s primary domestic housekeepers and molders of the next generation. 6. Steve Golin, The Fragile Bridge: Paterson Silk Strike, 1913, (Philadelphia, 1988). 7. Elizabeth Gurley Flynn to Woodrow Wilson, Jan. 10, 1918, File 188032–146, Record Group 60, Department of Justice, National Archives. 8. See especially the treatments of Haywood in Peter Carlson, Roughneck: The Life and Times of Big Bill Haywood (New York: W. Norton & Co., 1983), and J. Anthony Lukas, Big Trouble: A Murder in a Small Western Town Sets off a Struggle for the Soul of America (New York: Simon & Schuster, 1997). 9. Industrial Worker, May 25, 1911, p. 1. 10. For materials on Doree, Nef, and Fletcher, see Ellen Doree Rosen, A Wobbly Life, IWW Organizer E. F. Doree (Detroit: Wayne State University Press, 2004), which includes a remarkable series of letters that Doree wrote while a prisoner in the federal penitentiary at Leavenworth. 11. A. S. Embree to Editor, Solidarity, Sept. 19, 1917. 12. Cited in David Brody, In Labor’s Cause: Main Themes on the History of the American Worker (New York: Oxford University Press, 1993), 244–245. An excellent short - and HONEST - history of the IWW.